The Stellar and Paragon Posiflex Series are modular kiosks that can be tailored to blend into the existing store decoration and complement the company’s branding. Purpose-built for various self-service applications, this kiosk can be integrated with diverse peripherals, delivering versatile performance to help business owners enhance customer engagement. Packed with functionality and convenience in an appealing design, the interactive kiosk that is suited for retail stores, quick service and fast casual restaurants. It serves as a seamless extension of the existing POS terminals, helping store owners to drive sales during peak times, and offers various ways for consumers to order, pay and engage with brands. The Stellar KT-2130 Series is a modular kiosk that can be tailored to blend into the existing store decoration and complement the company’s branding. Purpose-built for various self-service applications, this kiosk can be integrated with diverse peripherals, delivering versatile performance to help business owners enhance customer engagement. The Stellar KT-2130 Series is available as a countertop kiosk or floor-standing kiosk with pedestal, providing modular deployment options within the same standardized family. Choose from a series of peripheral options including barcode scanner, service indicator receipt/ticket printer, bill acceptor, and card dispenser to create the kiosk solution you exactly need. All access doors open at the front to provide easy access for field service and user operation. There is no need to move the kiosk away from walls, or dismantle the main body of the kiosk, to remove components for servicing. Designed for public access, the Stellar KT-2130 Series is suitable for a wide variety of self-service applications such as: retail Point-of-Sale, loyalty program, restaurant self-ordering/food court preordering, hotel self-check-in, hospital patient check-in, cinema/museum self-ticketing, and access control. The Stellar KT-2150 Series is a modular kiosk that can be tailored to blend into the existing store decoration and complement the company’s branding. Purpose-built for various self-service applications, this kiosk can be integrated with diverse peripherals, delivering versatile performance to help business owners enhance customer engagement. The Stellar KT-2150 Series is available as a countertop kiosk or floor-standing kiosk with pedestal, providing modular deployment options within the same standardized family. 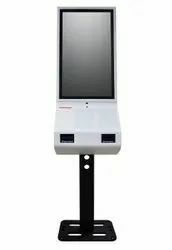 Designed for public access, the Stellar KT-2150 Series is suitable for a wide variety of self-service applications such as: retail Point-of-Sale, loyalty program, restaurant self-ordering/food court preordering, hotel self-check-in, hospital patient check-in, cinema/museum self-ticketing, and access control. Packed with functionality and convenience in an appealing design, the Paragon KT-3230 Series is a 32" interactive kiosk that is suited for retail stores, quick service and fast casual restaurants. It serves as a seamless extension of the existing POS terminals, helping store owners to drive sales during peak times, and offers various ways for consumers to order, pay and engage with brands. Designed with both functionality and aesthetics in mind, the Paragon KT-3230 Series features a bright, high definition 32" PCAP touch screen and sleek, durable enclosure, providing a contemporary and sophisticated human-machine interface. Incorporating a wide range of peripherals in self-service applications including 2D scanner, receipt printer, NFC, service indicator, a customized bracket for EMV payment devices, and more. Modular design makes installation, maintenance and component replacement easy, fast and convenient, and speeds up the return on investment by reducing repair cost. Offering various mounting options: wall mounted, single or dual sided operation, allowing for flexible deployment. Packed with functionality and convenience in an appealing design, the Paragon KT-3250 Series is a 32" interactive kiosk that is suited for retail stores, quick service and fast casual restaurants. It serves as a seamless extension of the existing POS terminals, helping store owners to drive sales during peak times, and offers various ways for consumers to order, pay and engage with brands. Designed with both functionality and aesthetics in mind, the Paragon KT-3250 Series features a bright, high definition 32" PCAP touch screen and sleek, durable enclosure, providing a contemporary and sophisticated human-machine interface.